The final volume in the series focuses on a crossroads in Emerson's life, the year 1832, when he resigned from his ministry at the Second Church of Boston. It includes a new and more accurate text of the single most important of Emerson's sermons, "The Lord's Supper Sermon." For the first time, this sermon has been transcribed from the manuscript Emerson actualy read from on the occasion of its only delivery. The sermon was not only pivotal in Emerson's career, it was historically important because of the controversy that ensued over formalism in religion. Volume 4 presents annotated texts of eight occasional sermons in addition to twenty-seven regular sermons, and an annotated text of relevant portions of the official records of the Second Church of Boston during Emerson's ministry. The sermons-most appearing in print for the first time-provide a thorough understanding of the evolution of Emerson's thought in the years immediately preceding the 1836 publication of Nature, a treatise of central importance to nineteenth-century American literature. 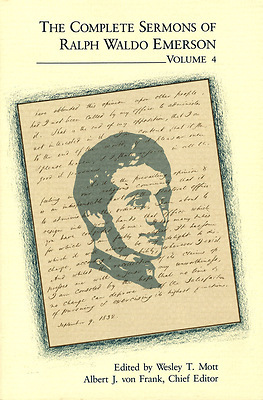 Transcribed and edited from manuscripts in Harvard's University's Houghton Library, the sermons are presented in a clear text approximating as nearly as possible the original version delivered to Emerson's congregation. As well as the detailed chronology, explanatory footnotes, and textual endnotes found in previous volumes, this one contains a comprehensive index to the entire four-volume collection. Such outstanding textual scholarship makes this edition a unique entrance into the spiritual life of a man who so profoundly influenced American thought.